7 years ago to the day Jesse released his debut solo album, "Beautiful Soul"! * Soon to be 4 studio albums; Beautiful Soul, Right Where You Want Me, Departure (Departure: Recharged), and Have It All. * 2 live albums; Live: The Beautiful Soul Tour and Live At the House of Blues, Sunset Strip. * 11 singles, 12 music videos, 3 EPs, 2 video albums, 13 soundtracks, 14 compilations, and 5 writing credits. * 7 tours; Beautiful Soul Tour, Backstreet Boys: Never Gone Tour, Departure Mini-Tour, Jesse & Jordin LIVE Tour, Departure Headlining Tour, New Kids on the Block: Full Service Summer Tour. * 5 video games; Kingdom Heart II, The Hardy Boys: The Hidden Theft, Kingdom Hearts 358/2 Days, Kingdom Hearts Birth by Sleep, Kingdom Hearts Re:Coded. * 2 starring TV show roles; Summerland and Young Justice. * 6 TV show guest appearances; What I Like About You, The Suite Life of Zack and Cody, Hannah Montana, Extreme Makeover: Home Edition, Law & Order: Special Victims Unit, and Greek (Recurring). * 13 movies; Pizza, Alvin and the Chipmunks 1, 2, and 3, Horton Hears a Who!, Unstable Fables: 3 Pigs and a Baby, Keith (<3), Tinker Bell 1, 2, 3, and 4, Beware the Gonzo, and The Clockwork Girl. * 11 awards show nominations. * 15 Awards Show Wins including 2009 ASCAP Pop Music Award - Song of the Year (Songwriter for Leona Lewis' "Bleeding Love"). 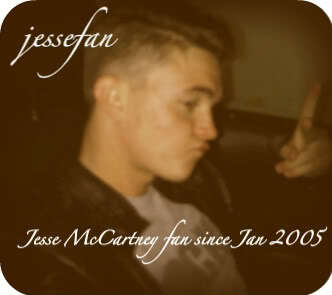 I'm so happy and proud of Jesse for all his accomplishments in his career in the last 7 years! CHEERS JESSE! Here's to 7 more that are sure to be EVEN BETTER!! Re: 'Beautiful Soul' 7th Anniversary! lol! Me too! I can still remember the first time I heard the song and exactly what I was doing at that moment. It just really doesn't seem possible that it's been 7 years since it was released. Btw, side note, that link is to the post on my tumblr! So, if you have a tumblr, you are more than welcome to follow me! I follow back too. But please keep in mind that I'm 25, so some of the stuff I'll post and reblog will be mature/nsfw and for 18 and over eyes only, so follow with caution. This is amazing!!! So pround of Jesse!!! 7 years have gone fast!! Well I've been a fan for 6 so that's gone fast too! !